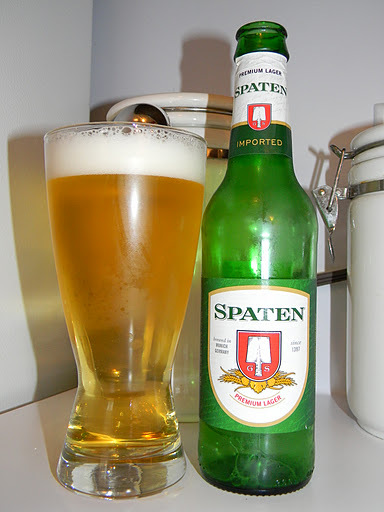 Spaten | Beer Apprentice - Craft Beer News, Reviews, Interviews and Info. Today, I thought I would get started trying some of the Oktoberfests that I have in my possession. The first one I’m going to sample is the Spaten Oktoberfest from the Spaten-Franziskaner-Brau located in Munich, Germany. We all know about the Fall seasonals, so let’s get right to the description of this beer from the website, spatenusa.com. Spaten Oktoberfest Beer, created in 1872, is the world’s first Oktoberfest beer, brewed for the greatest folk festival in the world. Every year, over and over again, countless Oktoberfest visitors share their enthusiasm about this beer. This Oktoberfest has an ABV of 5.5% and comes in a 12 oz. bottle. The beer poured a clear, copper/amber color with some burnt orange highlights showing through around the bottom of the glass. The crown was a very light tan color, not enormous in size nor did it have very good retention, but the lacing looked ok.
As I leaned in for a whiff, I immediately noticed a prevalent grass and grain profile accompanied by a very light caramel malt. Further fragrances of corn husk and wheat bread gave the aroma a touch more complexity, but overall I didn’t find it to be as robust as I thought it might be. The taste provided more of the grassy hops and grainy malt at the beginning. The caramel malt seemed to hide underneath until the brew started to warm, then the sweetness started to poke through a bit more. Some “earthy” hops gave the savor a touch of kick and the breadiness helped to round it out. The flavor was nice, even and fresh, yet not too complex or robust. The mouthfeel was medium, fairly dry, smooth and crisp. A nice bit of flavor was left behind on the palate too. Not bad in that regard. Well, this drink does put me in the mood for the Fall season, however I thought it was going to be a little more forthcoming in the aroma and taste. Nothing outstanding or over-the-top, yet nothing horrid or off-putting either. It had quite a few of the proper characteristics, but they weren’t forceful enough for me. It’s easily drinkable and would make for a great little session brew on a cool, crisp, Fall afternoon, although better Oktoberfests are out there in my opinion. It’s still a fun, enjoyable drink and worth a try if you see it though. Today’s craft beer review is of the Franziskaner Weissbier Hefe Weissbier (Hell) from the Spaten-Franziskaner-Brau Brewery located in Munich, Germany. I have yet to have a Franziskaner. I’ve heard much about them, therefore I’m looking forward to trying it and enjoying myself. While looking at the website, franziskaner.com, I stumbled upon this general description. 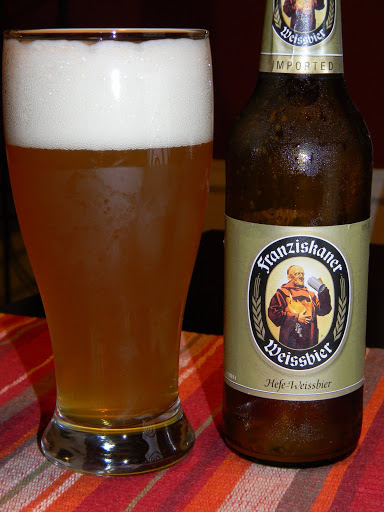 All of Franziskaner’s weiss beer products – Hefe-Weisse Hell and Hefe-Weisse Dunkel – are top-fermentation beers noted for their agreeable carbonation levels and zesty wheat flavour. The consistently high quality of our products makes Franziskaner weiss beers a refreshing taste sensation of a special sort. All Franziskaner weiss beers are brewed in strict adherence to the Bavarian Purity Law of 1516. Without further ado…… let’s get it poured. This brew came in a no-nonsense, 12 oz. bottle with an ABV of 5.0%. The appearance was of an orangish/yellow color. Very cloudy with some brighter yellow highlights around the bottom. The cap was bright white, rather creamy with real nice size, decent retention and some ok lacing. The aroma was a little more tame than most of the Hefe’s I have encountered. To me this was a good thing. It has all the typical fragrances one would expect: coriander, lemon citrus, banana, cloves, spices and hints of wheat/grain, however I judged that they seemed to be a bit more balanced, softer, subdued and cohesive. Not bad really. The taste was very reminiscent of the smell. The wheat/grain profile was more distinct, but the spices were more insignificant. The lemon and banana flavors were accounted for, however they were neither robust nor underscored, but seemed to sit right in the middle. As I made my way through the beer, I began to get the familiar “bubblegum” characteristic, which sweetened the analysis a tad. The mouthfeel was medium/thin, smooth, crisp, refreshing and relatively dry. Very easy going on the palate by leaving faint traces of flavor. This was a pretty good beer. I wouldn’t say that it was outstanding, but I wouldn’t describe it as poor either. It seemed to fall right down the middle. It had everything a good Hefe should. It fit the style. I was not surprised by anything nor was I distracted by anything. It was easy to drink. Enjoyable. Perfect for warmer weather and could be enjoyed by most anyone. It was solid. That’s about it really. Would I have another? Sure. I could have a few, no problem. The low ABV allows for this to be a perfect session beer. Give it a try if you see it. Thanks to all who have read, commented and encouraged this blog. It’s great fun.